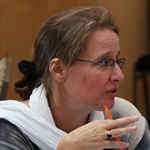 Marja Hinfelaar is the Director of Research and Programs at the Southern African Institute for Policy and Research (SAIPAR) and lead researcher for ESID’s politics of natural resources project in Zambia. Marja is also an Honorary Senior Research Fellow at The University of Manchester. Marja is a historian and political analyst, having published on the 2008 elections in Zambia in African Affairs and coordinated a longitudinal study on political party dynamics at the constituency level in the run-up to the 2011 elections. She has been resident in Zambia since 1997. Hinfelaar, M. and Achberger, J. (2017). ‘The politics of natural resource extraction in Zambia‘. ESID Working Paper No. 80. Manchester. Bebbington, A. with Gafaru, A.-G., Hinfelaar, M., Humphreys Bebbington, D. and Sanborn, C. (2017). ‘Political settlements and the governance of extractive industry: A comparative analysis of the longue durée in Africa and Latin America’, ESID Working Paper No. 81. Manchester. Co-editing a book on Zambian politics and elections. Researcher and Zambia coordinator for ‘Valueworks: Effects of Financialization along the Copper Value Chain‘. Marja is on the Advisory Board of the Journal of Southern African Studies (JSAS), UK; Founder and Editor at the Lembani Trust publishing house; and Editor of the Zambia Social Science Journal (ZSSJ).